Rather new swedish movie. A swedish soldier disappears into nazi occupied Norway. his brother leads a rescue team to locate him. Lots of violent m/96 scenes. Kind of dark movie. Well worth buying/downloading. It is available from amazon, just search for the title. It doesn´t rival Saving Private Ryan, but it is quite interesting for anyone into swedish surplus equipment, mausers, "white lightning" skiis, twin m/36 machineguns, old Volvo trucks and stuff like that. 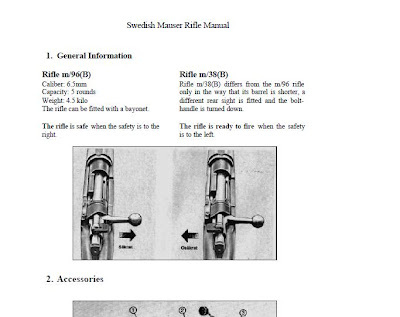 Here´s a manual for the m/38 - m/41 rifle, translated and ready for english speaking/reading shooters. It is a translation of a 1977 document. Click here for the .pdf!